Maximum Insulation As Warm as a Modern House! Building Regs Compliant Built like a House NOT a Shed! Zero Maintenance No Painting or Staining! Why not fit an Air Conditioning unit to your Garden Room or Garden Office and enjoy all year round comfort at a temperature to suit you? For the majority of customers, our standard wall mounted electric heaters are more than adequate to keep our Garden Rooms and Garden Offices lovely and warm, at a very economic running cost due to the extensive insulation fitted to our buildings. We fit these to all our rooms in a position to suit our client's requirements, and they are of course included in the price. However, in certain situations the fitting of an Air Conditioning unit offers benefits, particularly if there are a number of people going to use the building on a regular basis such as in a large office complex. 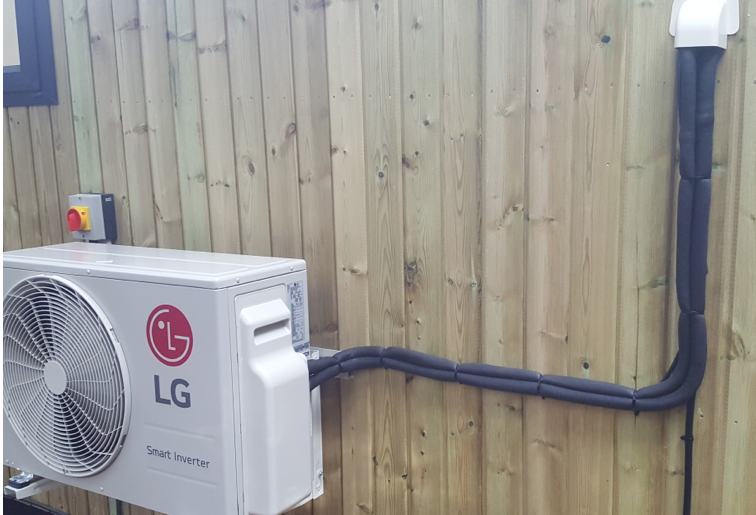 We now fit the LG Libero Plus units complete with Wi-Fi control and auto cleaning function which filters out impurities in the air and makes your Garden Room or Garden Office a cleaner and more pleasant environment. All of our LG systems come with a 5 year warranty as standard subject to manufactures conditions as long as the system is installed and maintained by a qualified F-Gas registered engineer. We will contact you as soon as possible to answer your questions and meet your needs. If the message is successfully delivered you'll be redirected to the main store page to continue your browsing. "Please convey my thanks to everyone and we were very touched at your kindness. You were all an absolute pleasure to have around and it felt very quiet without you!! We are absolutely thrilled with the Garden Room and have now painted the walls and ceiling and the laminate wood flooring and skirting boards are being fitted tomorrow. Once the skirting boards are painted we can move in the furniture and will be like pigs in muck!!! Many, many thanks once again, we are absolutely delighted with our Garden Room. After you left Heather sat on the decking with a glass of wine, this is the life! Take care and you all have a safe journey tomorrow. Thank you once again." "We trawled through the internet and Rubicon sounded like the best bet for what we were after. We made an appointment and went down to the showroom on Deeside. There we met Managing Director John, spent time looking at the different examples on show and examining the products, and then had a good chat about what we needed. We never felt rushed or pressurised, and had time to think about what we wanted - his whole manner makes him such a good person to deal with. We felt that we were getting a good product. What Rubicon offered was perfect for what we wanted and, once we started the process with them, the work was done in just two to three weeks. The team turned up every day at the time John said they would, and were polite and very easy to get along with. Having them here working in the garden was no trouble at all and I would recommend Rubicon without a doubt - in fact some of the neighbours have already been round to see it and ask where we got it. I can say hand on heart that John and his the team from Rubicon were the nicest people we have ever had work for us." "Dear John, Thank you very much, all very professional from your company throughout the construction and installation. I cannot find anything, but if there is somewhere where I can place a review or recommendation on your web site I will be pleased to do so. Please just send me a link. As and when the garden, now under snow is complete, I will forward some photos, probably June the way the weather is. I have received a letter from Flintshire County Council asking for me to comment on your services. Just to let you know that I am returning it, highly recommending your company. All the very best to you and your company in the future. We are really pleased with our Garden Room and I would not hesitate in recommending you to any future customers. Just ask them to call me." "We wanted to get a Garden Room that David could use as a separate office that was peaceful and quiet when he’s working from home. We liked what we saw at Rubicon’s showroom in Deeside straight away, and got on very well with the MD John Lyon – he immediately gave us the confidence that he would deliver what he promised, and he did. We took one of their standard Garden Offices and adapted it so that it would work for us, and nothing we suggested was a problem for Rubicon – they were really good to work with. They kept me posted all the time about what was going on, what stage they were at and who would be coming and what they would be doing the next day. They tidied up after themselves too, and really minimised any inconvenience. What was very important to me as well was that we had my elderly father staying with us at the time, he was 85, and they were so very respectful to him. Everyone from the young apprentice to the seasoned builders treated him brilliantly and talked to him about what they were doing every day while I was out at work. The Garden Office is lovely and warm as it’s fully heated, and so can be used all year round. I would most definitely recommend Rubicon Garden Rooms to anyone." “Rubicon’s extension been fantastic, and it has really changed Ray’s life. It’s very warm and fully insulated, light and comfortable - it is easy to look after. We can get Ray in and out of bed and into his wheelchair much more easily, and it means that he has somewhere to go that’s his, for some quiet time. He loves sitting by the big window watching the birds and wildlife, or enjoying the views of the garden. The extension is very well made and went up quickly, and has changed our life. It means Ray has somewhere to sit, and we haven’t lost our lounge. When our three grandchildren come round, they love to go into his room and see him. I can’t thank Rubicon enough for the help their team have given us, they have been brilliant." "Hi John, Just got back from a couple of days in London. I can confirm that invoice has arrived and has been paid. Many thanks for ALL your work. At our little garden party last Sunday all commented on the new Garden Studio - and one chap has examined it thoroughly (!!) and will contact you to arrange one for himself. All like the grey!! Hope you have a lovely Christmas, and hope we can keep in touch. Best wishes. PS Jan will send you photos with some plants in front!" "I saw Rubicon Garden Rooms online and wanted to find something that was nearby so that I could go and see what they were doing and talk to people face-to-face about it. I went along to the showroom in Deeside and I was very impressed with what I saw, and with the Managing Director John Lyon. I nearly ordered a conservatory but changed my mind at the last minute when I realised that one of these Garden Rooms would be nicer and much more use to me all year round. It was quite an investment so I took some time to think about it but eventually I decided to go for it and treat myself, as I was still working but also had my pension coming in. I went back for another chat and told them what I wanted and they just came and did it. They knocked down the old lean-to and started again and created this lovely room, leading on from my main living area. Rubicon Garden Rooms were just lovely to work with and did everything I asked. From the very beginning they gave me good advice and guidance and made it a really easy process throughout – I’d definitely recommend them to anybody else looking to extend their home simply and quickly." "One of our disabled tenants required access to ground floor facilities, including a bedroom and bathroom. This need was urgent, so instead of a traditional build, which would be highly disruptive to the tenant, we approached Rubicon Garden Rooms who provided a high quality Garden Room attached to the property, which has the potential to be reused elsewhere in the future. We were delighted that Rubicon were able to quickly provide this essential modification to the property that met the council's rigorous standards for such work." "We had an office on a local business park, but being able to move into our own premises here has been a wise business move. We've got the perfect, self-contained space with everything we need. We can now open our French doors and have lunch on the patio in a lovely established garden, which is something most people would love. We did a lot of research and found that the prices were all very similar,” said Julian. “But what we liked about Rubicon was the fact that we could go and see their factory in Deeside and the examples they had on show. We also visited a few completed buildings and talked to the owners and we heard nothing but positive feedback so we decided to go with them. Most of the structure is prefabricated at Rubicon’s base and then they come and slot it together on site. They were great to work with – they were all very competent and everything I asked of John and his team, they delivered." "Hi John, Hope you have enjoyed your weekend! Building is brilliant, we are extremely pleased with it, plaster is drying out nicely. I have sent over the last payment to your bank this evening.....On behalf of Clare & myself, I would like to thank You and the build team (Buster,Lee,Martin, Liam, Kurt & Dad), and not forgetting the window guys... for all your hard work and excellent eye to detail on our lovely pool room! Will let you know when everything is completed and you are welcome to visit with your Marketing PR person if you need any further photo’s. Look forward to meeting up for a cuppa soon :)"
Register for our newsletter and receive a free Builders Contract!